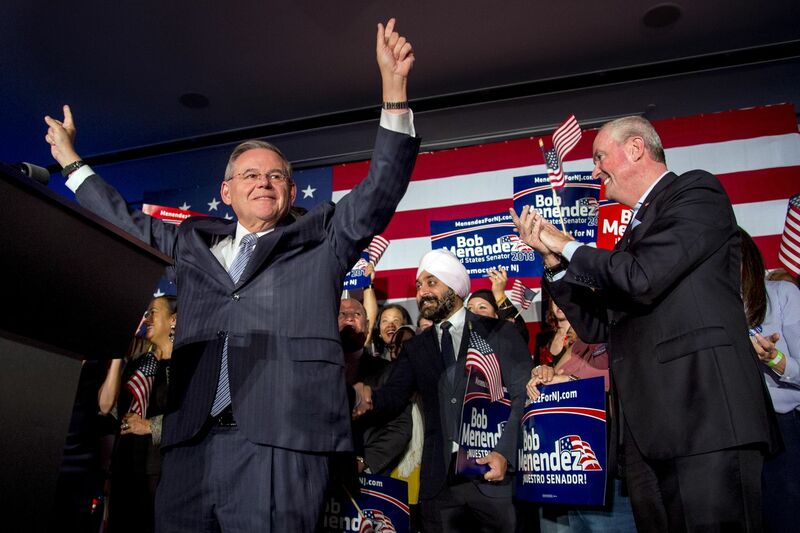 U.S. Sen. Bob Menendez celebrates his re-election in Hoboken November 6, 2018. N.J. Gov. Phil Murphy is at right. New Jersey Democrat Bob Menendez was reelected to the U.S. Senate on Tuesday, riding anti-Trump enthusiasm to overcome the lingering cloud of his bribery trial and an onslaught of attack ads aired by Republican Bob Hugin. Across state lines, Pennsylvania Sen. Bob Casey coasted to an easy win over his Republican challenger, Rep. Lou Barletta. That turned out to be a rare bright spot in the Senate for national Democrats. Though Democrats were relieved by Menendez's victory, it may have come at a cost. The unexpectedly tight race forced national Democrats to divert resources from key battleground states — such as Missouri, Florida, and Indiana — in their long-shot chances of taking the Senate. And though some races were still undecided, the GOP appeared poised to expand its majority in the chamber. The Garden State hasn't elected a Republican to the Senate since 1972, but Democratic strategists were bracing for a possible loss by Menendez, worried that college-educated suburbanites couldn't stomach a vote for the incumbent and that urban voters wouldn't go to the polls for a midterm election. Hugin, a former pharmaceutical executive from Summit, lent his campaign $36 million to make the race competitive. New Jersey voters' discomfort with President Trump — a theme echoed throughout the campaign — may have proved too big a hurdle for Hugin in a state where registered Democrats outnumber Republicans by 920,000. Menendez led by nearly 10 percentage points with almost all precincts reporting, according to unofficial returns. "Today is a victory for hope over hate, for facts over fiction, for inclusion over division, for hard work over ripping people off," Menendez told a crowd of about 200 supporters at a hotel in Hoboken, where he was introduced by Gov. Murphy. "I am so proud that New Jerseyans rejected the politics of personal destruction and the false, negative salacious ads. "To those who did not vote for me or were disappointed in me, I pledge to spend every day fighting for you and your families and to earn back your respect," said Menendez, 64. "The one thing I can promise every New Jerseyan is this: I will not back down." Menendez's reelection came a year to the month after the senator stood in a courtroom at the federal courthouse in Newark as a judge declared a mistrial in his corruption case, saying the jury was hopelessly deadlocked. Prosecutors had accused Menendez of accepting lavish gifts from a Florida doctor, such as free trips on a private jet and vacations in the Dominican Republic, in exchange for advancing the doctor's personal and financial interests. The judge later acquitted Menendez of some of the charges and prosecutors dropped the case. But the federal indictment and evidence presented at trial, plus a bipartisan reprimand handed down by the Senate Ethics Committee, gave Republicans a powerful line of attack for the campaign. For his part, Menendez depicted Hugin as a Trump Republican and greedy Big Pharma boss who repeatedly raised the price of a cancer drug. Hugin, 64, who like Menendez is a native of Union City, stepped down as executive chairman of the biotech company Celgene late last year and quickly consolidated GOP support for his Senate candidacy. Bob Hugin, the Republican candidate in the U.S. Senate race in New Jersey, with his wife, Kathy Hugin, and their daughter Hilary Hugin as he concedes victory to Sen. Bob Menendez (D., N.J.) during an election night party in Mountainside, N.J. He hit the airwaves early with television ads reminding voters of the corruption allegations, and Menendez's standing with voters plummeted in the polls. A virtually unknown challenger in the June Democratic primary won a remarkable 38 percent of the vote against Menendez — an unmistakable message that even some core supporters were unhappy with the senator. Some political observers wondered why the party had not supported a more viable candidate. Menendez barely seemed to try to improve his image with voters, instead using his resources to attack Hugin and argue that the Affordable Care Act's protections for people with preexisting medical conditions and the fate of Social Security and Medicare were at stake in the election. Hugin served as New Jersey finance chairman for the Trump campaign in 2016 and contributed more than $100,000 to pro-Trump groups. But he presented himself to voters as a centrist with liberal social views, and said during a debate that he was "not a Trump Republican." In addition to going after Menendez on his ethics problems, Hugin in October aired TV ads that recirculated unsubstantiated allegations that the incumbent had slept with underage prostitutes in the Dominican Republic. The allegations — first lodged by an anonymous tipster in 2012 — led to an FBI investigation, but the authorities never confirmed them. By mid-October, Democrats in Washington were getting nervous. Senate Majority PAC, the super PAC aligned with Senate Democratic leader Chuck Schumer of New York, spent $7.6 million on anti-Hugin ads in the expensive Philadelphia and New York media markets. Menendez might not have needed the help after all. Television networks began calling the election for the senator just minutes after polls closed at 8 p.m.
Casey's seat was considered far safer; he led by 13 percentage points with nearly all precincts reporting. Barletta, who was known for his hard-line position on immigration before Trump ran for office, lagged Casey in fund-raising, making it difficult to tell his story. Casey, 58, of Scranton, looked past Barletta for much of the race, presenting himself as a senator willing to work with Trump on issues like infrastructure, middle-class wages and healthcare policy. But he also said he would challenge a president enthralled to special interests. "I think [voters] want more balance," Casey said before the polls closed Tuesday. "I think they want a check on the administration." In his victory speech, the senator called his election "a victory for people across our commonwealth who want a new direction in Washington."